On-screen and accelerometer controls work great for some mobile games, but other times you just want a real controller. 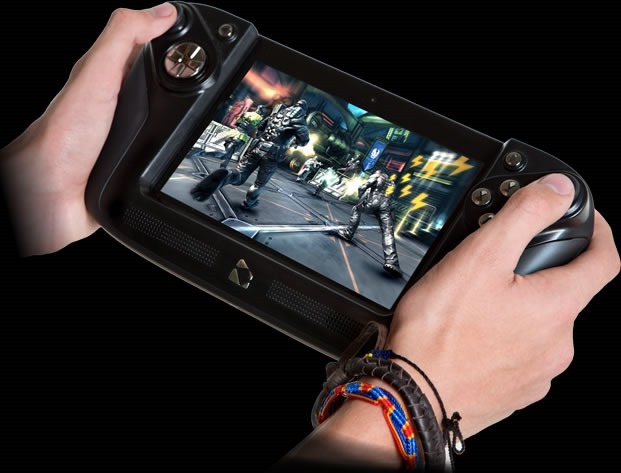 Wikipad, the company behind the gaming-centric Wikipad tablet is introducing a new product called the Gamevice at CES. This is a split controller that expands and contracts to fit on your mobile device. The Gamevice has what Wikipad calls a "flex bridge" design. Presumably the middle portion of the controller can be adjusted to snugly fit around your mobile device. The name probably refers to the vice-like grip it will have on your precious phone or tablet. It's a kind of pun, you see. The Gamevice has dual analog sticks and triggers, but no official price just yet. Owners who bought the Wikipad 7-inch tablet already have a controller for their device, and they are about to get an update. Alongside the Gamevice announcement, the company has confirmed that Android 4.2 is hitting the Wikipad as an OTA. The update includes all the Android goodies you'd expect, but also some free stuff. Owners will get these six paid games with the update: Shadowgun, Reckless Racing, Raging Thunder 2, Sprinkle, Granny Smith, and Zen Pinball HD. Dead Trigger 2 is also included, but that's a free game anyway. The new OTA will additionally include an enhanced gamepad mapper to make more games playable on the Wikipad. (LOS ANGELES, CA) – Jan. 3, 2014 – At CES 2014, Wikipad, Inc. (www.wikipad.com) the leader in mobile gaming platforms including the Wikipad 7 Android gaming tablet announced the creation of Gamevice a next-generation detachable console-like controller for mobile devices. Gamevice, which received a utility and design global patent, transforms mobile games into full fledge mobile console experiences with a slim portable controller that effortlessly connects to mobile devices. Gamevice offers a unique patented flex bridge design that expands or collapses to fit mobile devices. “We value the opinions of our community. We heard from many people who either expressed love for the Wikipad 7” or who already owned an iPad or an Android or Windows 8 mobile device and wanted us to make a controller that worked for them. We are currently working on versions for Windows 8 and Android devices. We have not forgotten other important OS systems and we hope to announce additional support those in the near future,” said Fraser Townley, President of Wikipad, Inc.
Gamevice transforms mobile devices into portable video game consoles complete with dual analog sticks, both L1/R1 and L2/R2 analog buttons, an analog D-pad, and four analog action buttons – every button gamers already use and in a form factor that will be familiar. Wikipad, Inc. (www.wikipad.com) today announced an important over-the-air (OTA) update for its premium 7” gaming tablet that will automatically refresh the Wikipad to add new features such as controller mapping, the addition of Android 4.2, new content such as Madfinger Games’ Dead Trigger 2 and access to a host of great games from new content partner WildTangent Games. The OTA showcase’s Wikipad commitment to redefine gaming in a mobile-centric world. The 7’ Wikipad tablet offers the functionality of a portable premium tablet with the exciting video game console experience. To receive the update, Wikipad owners must connect their Wikipad to the Internet and install the software update when prompted. The whole process takes a few minutes. One of the limitations of mobile games is that complex games often have control schemes not suited for touch screens. Wikipad has released its Wikipad Controller Assistant allowing allows gamers to transform the touchscreen controls of virtually any Android game into a console-like experience using Wikipad’s patented gamepad controller. The updated version of Jelly Bean includes a number of improvements and new features, including improved battery life and the ability to create multiple user accounts. Android 4.2 enables gesture typing by sliding fingers across the virtual keyboard, improved camera features, gesture typing, lock screen widgets and Google Now updates that pull package tracking, hotel and flight details, restaurant reservations and other important meetings and other time sensitive information straight from Gmail. Wikipad owners will find many small improvements that enhance the Wikipad experience, whether you are gaming, using the Wikipad for work, or just browsing the web and having fun. WildTangent Games offers access a host of premium games to consumers with WildTangent’s patented technology. Consumers receive free in-game items as well as free play of premium games courtesy of brand advertisers. In addition, consumers can rent games for a fraction of the retail price, with 100% of rental going toward ownership, or buy them outright. WildTangent adds to an already impressive list of content partners including Google Play from Google Mobile Services, PlayStation®Mobile games from Sony Computer Entertainment Inc., and TegraZone – NVIDIA's free game discovery app. The update also adds Madfinger Game’s award-winning and visually stunning first person zombie shooter Dead Trigger 2. The original Dead Trigger was a smash hit with more than 23M downloads, and Dead Trigger 2 offers even more bloody action and stunning HD graphics, placing gamers in an apocalyptical world where humanity must make its final stand against the growing onslaught of zombies.